Alias: The Vampire, Monster, Beast, etc. Personality: Previously a happy and content dragon, Equinox now believes she is a hated monster, finding little joy in everything. She is rather cynical and being around her tends to make one depressed since she's one of those people who are never happy and always look on the bad side of things. Equinox often finds ways to express her views and opinions, but it's not very often that it's shown. She is a dragon who is standoffish and stays away from others. She is afraid of meeting new people in fear of being shunned and scaring them away. However, despite her fear rooting from her Vampirism, Equinox does not believe her condition is a bad thing. She is happy that she has it and is even honored since she's the only vampire left on Pyyria. However, it is like a bad luck charm, but it's often Equinox herself who brings bad fortune to herself rather than her condition. The only emotion Equinox is capable of feeling is fear. Otherwise, she is completely emotionless and has no feelings of joy or sadness despite always looking at the bad side of things. If Equinox's appearance isn't unnerving to you, then her blank slate of an attitude should be. However, there is a way to unlock her emotions so she could feel again. . .
~Even though she's a hybrid of the SkyWings, she can still go pretty fast. Sure, not as fast as Purebreds but still fast. ~Equinox's dark scales help her blend in well at night. ~She is a clever little thing and can solve puzzles and brain teasers with ease. This also means she can read the facial expressions of others well. ~Like all vampires, Equinox has a drastic weakness to fire and sunlight. She burns VERY easily and cannot heal her wounds when she's out in the sun. Much like the legend with Icarus, if she flies too close to the sun her wings can burn. This also gives her a weakness to FireWings, despite her having a teeny tiny drop of FireWing blood in her own veins. ~Equinox's monstrous appearance can scare others away, with her ugly burn marks and intimidating fangs. This makes her almost unapproachable. ~As said before, Equinox lacks emotions, so she doesn't feel sympathy for others and is rather uncaring. Appearance: Equinox looks nothing like her former self: a pretty pink dragon. Now, due to never feeding off blood for years, she has a twisted look that makes her existence as a monster obvious. She still has the lean, slender build of most SkyWings but doesn't have the common yellow scales of them. Her primary color is black with a white underbelly. She has white swirl marks on her hips, along with crimson freckles. Red stripes go down her neck and tail. Her back has a line of small red spines, but it ends before her tail begins. Her tail ends with a tip that resembles a cross. Equinox has a particular white mark on her face that resembles a skull, and it covers her whole snout. She has red horns. Like all SkyWings, her wings are very large. Her wing membranes are red. One can see Equinox's ribs as well, and she has ugly burn marks all over her from a particular point in her history. Her fangs go past her lower lip. Equinox carries a trait from her mother into her vampirism: a simple stamp in the center of her chest. This stamp is more like an opal imbedded into her. Equinox cannot remove it herself. . . But someone she trusts can. This person would be a mate or a potential mate, and once this thing is removed is when Equinox will be able to feel emotions once again. Hatchlings: Probably not. Who would want baby vampires running around everywhere biting people? 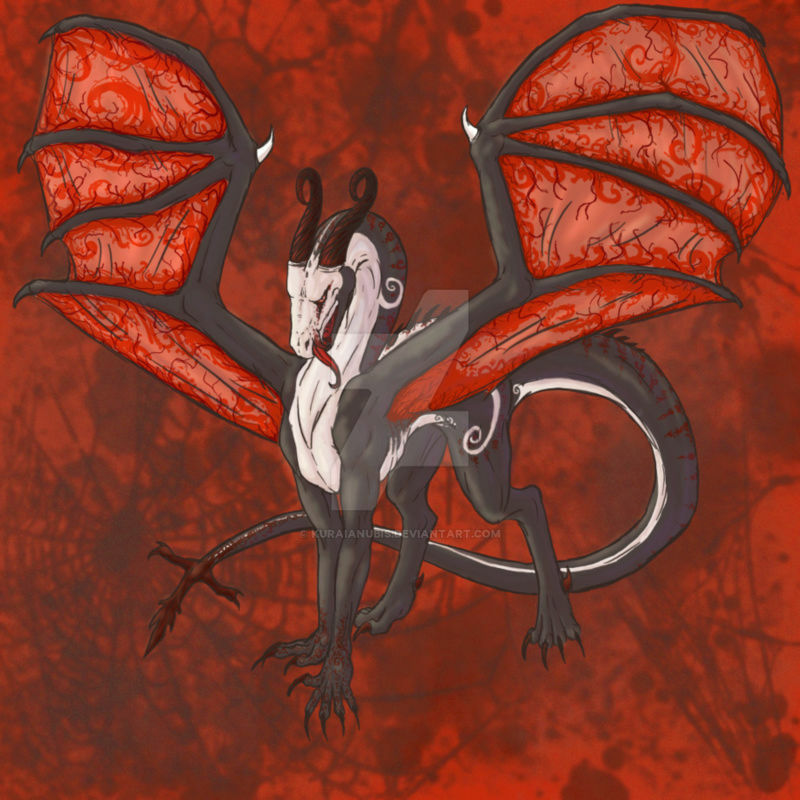 Equinox was hatched alongside her brother in the SkyWing Tribe to Moka and Akreious. Her brother disappeared at a very young age as did her mother, which made Equinox be raised alone by her father. She was hatched during the reign of Kokoro, and during her younger years her father was deemed Lieutenant of the SkyWings. However, he disappeared as well, which made Equinox alone. During her Trainee days she somehow stumbled across her mother again, but she disappeared once again. 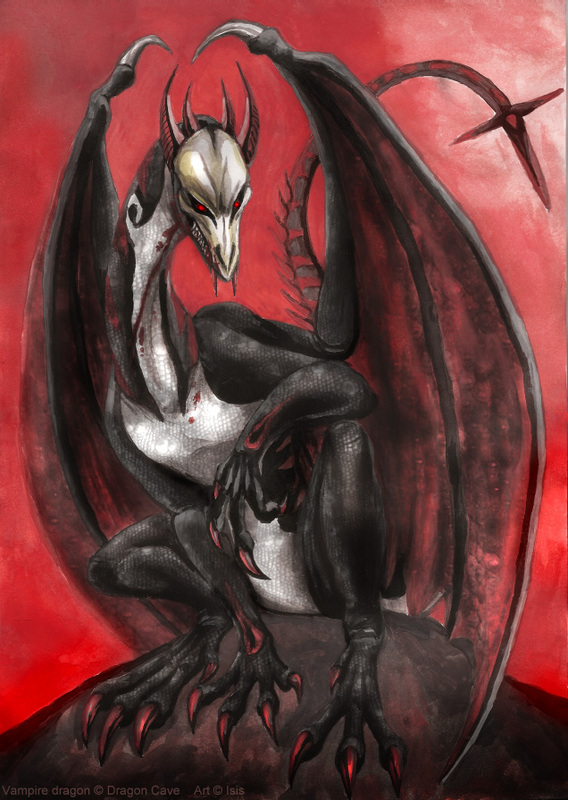 See, Moka was perhaps the only vampire in Pyyria, and Equinox was given that unique trait through genes. In her days as a Trainee keeping her hunger for blood sated was not that tough. However, as she grew up, she realized how biting the necks of her fellow SkyWings could be very harmful, so Equinox stopped feeding for the good of her Tribe. What she didn't know was that what would happen to a vampire after a long time foregoing a meal of blood. Equinox's whole appearance changed drastically seemingly overnight, and she looked like a monster. Afraid of what her fellow SkyWings would think, she flew away before anyone could see her, but there was one problem. Vampires have a weakness to the sun, so while Equinox was flying the sunlight burned her scales, leaving scars for her to remember. She found a home within the rogue lands but can only go out at nighttime. Equinox is living a painful, emotionless life. A vampire goes in a lot of pain and drastic changes when they haven't fed in a long time. Over the years she lost her emotions. What she doesn't know is that after decades without blood, a vampire can go insane.